Well, I’m not the only one who loves glitter hair, and neither is Adrienne Maloof. It’s been the number one search phrase for my blog since putting up the previous entries, and since I haven’t quit playing with my sparkly hair, I figured it was time to talk some tinsel. A week had passed, and all of my tinsel had nearly fallen out when hubby turned to me, while cooking breakfast for the boys together one Saturday morning, reached to pick at my scalp while saying, “You have something in your hair…oh! You did that, didn’t you?” He said he loved the tinsel, thought is was cute, and so I immediately tied in a headful more of tinsel strands. Attention whore, who me? I’m better at tying them in now, practice practice practice, but in general it helps to tie the tinsel to a few hairs, think 6-8 strands, rather than small chunks of hair of 30ish strands. The ones I tied to larger chunks of hair fell out twice as fast. Washing with tinsel is no issue at all. I usually towel dry and then air dry, but I’ve found it’s better to finger-comb wet hair and use a boar bristle brush for removing tangles in dry hair. When you brush your hair, place one hand on your scalp while brushing. This helps hold the tinsel strands from being pulled out quickly. And they do fall out quickly. They fall out when I brush, when I style my hair (which for me is minimal, I don’t use blow dryers or curling/flat irons). They fall out when I sleep, a lot. So get used to tying in a few strands every day in order to maintain your tinsel look. If I have time after doing my makeup, I usually tie in more tinsel then. And if you know me, and you want tinsel for yourself? Call me, darlings… or drop me an email. I can help! Hopefully I’ll try to take pictures soon to share as well. The holographic silver is what I’m wearing today — I like the bright stuff for the festive holidays — but the copper is pretty, subtle but still very noticable. My new obsession has just bloomed, thanks in part to Katy Perry. Weird, eh? 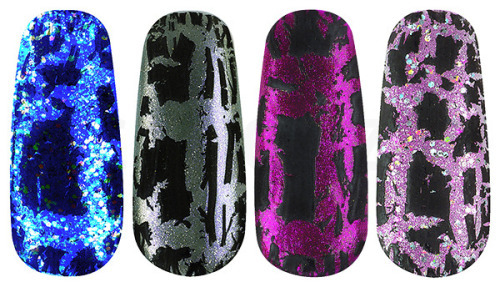 OPI’s newest release is called Black Shatter and I can’t wait to get my fingernails on some. Although I have yet to try it for myself, when applied over an existing color, the black dries in a “crackled” design. And OPI’s put serious cash behind their product by landing Katy Perry as the spokesmodel. Personally, I want the stuff for one reason only — to create leopard print nails. Now to find me the perfect orangey-tan to create the leopard look… I’ll be keeping my eyes peeled! And if I get my fingers on some, or if I get some on my fingers, I’ll be sure to report more! Seriously, people. Pay attention, for tonight may promise to be some gooooood Fashion TV. And yes, it’s on Bravo… go figure. Tonight is the Fashion Show where the Real Housewives of Orange County, as well as a sprinkling of Housewives from New Jersey, are getting a make-under by our contestants. And from the teasers they’re showing, it looks like Calvin was paired with Teresa… fireworks? Train wreck? Shark tank? All deliciously intriguing possibilities. And, if that weren’t enough to please me while doing more Christmas gift knitting tonight, there’s Watch What Happens Live with guests Iman and Diane von Furstenberg. DIANE VON FURSTENBERG! I love everything about her, in fact I adore her. I love her clothes, I love her face, I love her work, I love her tweets, and I *love* wearing her clothes. Truly it’s Don’t Miss Fashion TV… you can’t blame it on me if you forget to set your DVRs. I warned ya! Glittery locks I had wished for? And glittery locks I received. The package came very quickly, and by Monday of this week I was tying tinsel into my hair. As for the process of doing it yourself? Tricky, not impossible, but not easy. But I’m challenged by French braiding my hair. I found that I could tie about 4-5 glitter strands in a day before my arms felt like they would fall off from holding them up for so long. Tie one, take a break, come back during baby’s nap, tie 2, take another break. I started with the coppery brown because it’s closest to my hair color, but also enough of a holographic pop that it was hugely noticable, to me. And then, I waited for someone else to notice. And I waited. And I waited. Tuesday came, still no one I live with noticed the tinsel. In fairness, I don’t see my guys (hubby and DS1) a lot in a day. Three strands fell out, one during sleeping and two during hair brushing. I tied them back in during baby’s nap again. And another day passed, and another. Same cycle. Tinsel strands fall out at an average of 3 a day, and I tie in about 4 a day to maintain the look. It’s time consuming, by this point, and the novelty had worn off. The arm fatigue during the tying-in process had not. A full work week, and no one — NO ONE — has mentioned the tinsel to me. Now I don’t go out a lot, just mostly Mommy errands like picking up kids from school, and such. But not only did the boys in my house not notice, neither did anyone else. Maybe they were being nice and not saying anything because the tinsel looked ridiculous on a 40-something? Maybe I should dye my hair blue, like my good old 20-something days, and see if anyone notices? These are the same men who didn’t notice a new facial piercing until I mentioned it myself, a week after the fact. Perhaps if I had used the silver disco ball tinsel it would have garnered more attention? Sigh… well, it was fun. For me. And now the arm fatigue is keeping me from doing more right now, so I have 2 random strands left in my hair, and don’t plan on adding any more. They do make brushing and combing your hair a little tricky. And I’m still waiting for the Cilia eyelash growth stimulator to arrive. At least the hair tinsel people have superfast delivery.